I Love Lucy: I Heart Mom Edition DVD Giveaway – 2 Winners! Fine Print: I was given a copy of the movie for review and the company is giving two more to readers. All opinions and statements below are my own. Calling all I Love Lucy fans! There is a fun new DVD that was developed especially for mom! 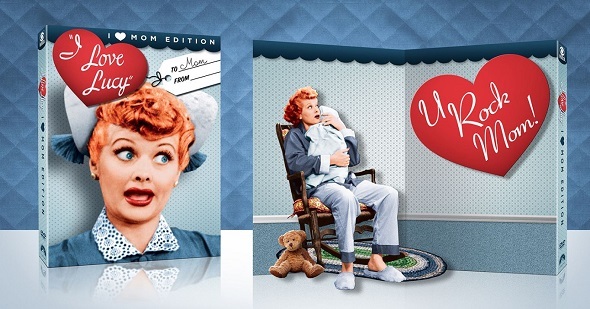 The I Love Lucy: I Heart Mom Edition DVD will remind you of both the magic of Lucy & Ricky as well as how funny it can be to go through pregnancy and babyhood when you’re not the one in the driver’s seat! This would be SUCH a great gift for mom and you can find it on Amazon for $10 or for various prices at Walmart or Target! To get everyone excited about loving Lucy, I am giving two lucky winners a copy of the I Love Lucy: I Heart Mom Edition DVD! To enter this giveaway, complete any or all of the options listed below. Giveaway ends 5/8. Good luck! My mom loves Lucy! This would be so great to give to her. My favorite Lucy episode is the one with the Chocolate Assembly Line. Thanks for the giveaway. I hope that I win. One of my favorite episodes is when they are stomping the grapes. When Lucy was working at a candy factory and the belt was going to fast so she started eating the candy and put them down her dress to try to keep up! I love the Lucy episode in which she is on the factory line with the chocolates!!! My favorite episode is when she does the vitamin commercial and makes a face every time she tries a spoonful because it’s horrible but she is suppose to be promoting it. I crack up every time I watch it. Of course the product is horrible, it’s called “Vitameatavegamin”, who wants vitamins, meat and vegetables in liquid concentrated form? No one does. Classic! i love when she’s on the lawnmower and goes out of control. this is my fave show! Veta vita vegimen episode is classic! I remember the grape crushing episode and the cookie(?) conveyor belt episode. It’s been so long since I watched the show.